Hong Kong has its charm as a vibrant metropolis and financial hub in the Far East, but it also has its issues of insanely expensive housing and tremendous gap between the rich and poor. New immigrants, elderly and young people living in bunkers about the size of coffins (known as “coffin homes”) have made the headlines in recent years while at the same time government’s land sales and housing prices have skyrocketed to record levels. Because of its concentration of inexpensive tiny bunkers and decades-old apartments, Sham Shui Po (深水埗), an old neighborhood in West Kowloon, has often been associated with issues of poverty and urban decay. With its vibrant street markets selling everything from cheap electronics, second hand appliances, clothing, toys, and a wide range of DIY parts, from buttons and fabrics, to cables and motors, Sham Shui Po seems like one huge flea market. 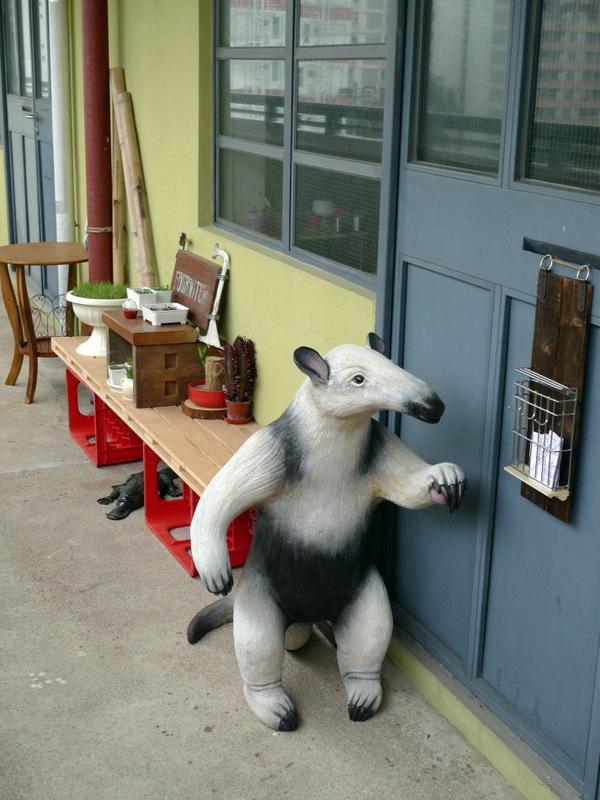 Beyond the chaotic appearance, however, visitors may find a special nostalgic charm in this neighborhood, with traces of the beautiful old Hong Kong that have been mercilessly replaced by cold and glassy highrises, luxurious malls, and uninspiring chain-stores throughout the city. A walk in Sham Shui Po is a diverse journey full of chaotic street markets, affordable and unpretentious food, lovely heritage buildings and much more. Compared with many upscale residential neighbourhoods and the city’s commercial heart, the streets of the relatively less affluent Sham Shui Po are much more human and pedestrian oriented. Sham Shui Po still has a variety of traditional businesses from Old Hong Kong, such as a high concentration of pawnshops. Some old apartment flats in the area have been converted to subdivided rental bunkers. The worst type is called “coffin homes” due to their tiny size similar to real coffins. Every view in Sham Shui Po seems layered, chaotic and complicated. Quite a number of streets in Sham Shui Po are famous for street markets. Catering for different clientele, each market zone is more or less designated for a distinct type of merchandises. Looking from above, the streets of Sham Shui Po seem like an abstract painting composed of rows of colour swatches. While the streets are vibrant and chaotic, the rooftop level seems like a totally different world. Ki Lung Street (基隆街) is popular with customers looking for DIY supplies for clothing, including fabrics, buttons, ribbons, trims, zippers, you name it. Nicknamed Street of Beads, Yu Chau Street (汝州街) is another street in the area famous for DIY clothing accessories. Known as the miniature of Sham Shui Po, Pei Ho Street (北河街) is a market street famed for its fine clothing in really affordable prices. Another well known market street is Apliu Street (鴨寮街), a large flea market specialized in electronic parts and second-hand electronics. There are many stalls at Apliu Street (鴨寮街) specialized in electronic repair. Other than shopping, food lovers also have their reasons to visit Sham Shui Po for some of its more small, traditional and down-to-earth eateries that are disappearing fast in other areas of the city. Sun Heung Yeung (新香園 (堅記)) on Kweilin Street (桂林街) is one of the most popular Hong Kong style cafe in Sham Shui Po, famous for its beef and egg sandwiches. Established in 1957, another renounced eatery in Sham Shui Po is Wai Kee Noodle Cafe (維記咖啡粉麵 ) on Fuk Wing Street (福榮街). Wai Kee Noodle Cafe (維記咖啡粉麵 ) is famous for their beef and pork liver noddles (豬潤牛肉麵) and Coconut Jam French Toast (咖央西多士). Kung Wo Dou Bun Chong (公和荳品廠) or Kung Wo Soybean Product Factory is another major attraction for food lovers. With over a century of experience, Kung Wo Dou Bun Chong (公和荳品廠) sell all kinds of bean curd or tofu products. Even the interior of Kung Wo Dou Bun Chong (公和荳品廠) is full of nostalgic ambience. Apart from shopping and eating, Sham Shui Po is also a great place to admire Hong Kong’s old architecture. The government proposes a series of urban renewal. Sham Shui Po still has a considerable amount of tong lau (唐樓) or old tenement buildings with a covered colonnade on street level. The ground floor was usually occupied by a small shop, such as a pawnshop or food vendor. This type of architecture once dominated much of Hong Kong before 1960’s. The 5-storey Nam Cheong Pawn Shop at 117-125 Nam Cheong Street was built in the 1920’s. Even the iconic cantilevered pawnshop signage have becoming rarer nowadays. 58 Pei Ho Street is probably one of the most famous heritage buildings in the area. Built in 1920’s and served as a pawnshop until the 1970’s, it was then converted into a shop selling dried seafood until present days. The curved balcony of 58 Pei Ho Street is quite unique. The amazing feature window a level above the street is such a lovely design gesture back in the old days when there was less vehicular traffic. Old Chinese calligraphy signage can be seen all over the streets of Sham Shui Po. Before graphics design being computerized, most Chinese signage came from the hands of a professional calligrapher. Each neighborhood allowed a few calligraphers to earn a living, and each calligrapher had his/her own style. It’s the individual human touch that makes these calligraphy signage unique, especially in the age of computerization and standardization. Built in the 1940s, Hang Jing Pawnshop is no longer in business. The colonnaded area is now used as an outdoor workshop of a nearby shop. On the columns, beautiful calligraphy of the former pawnshop is still visible. 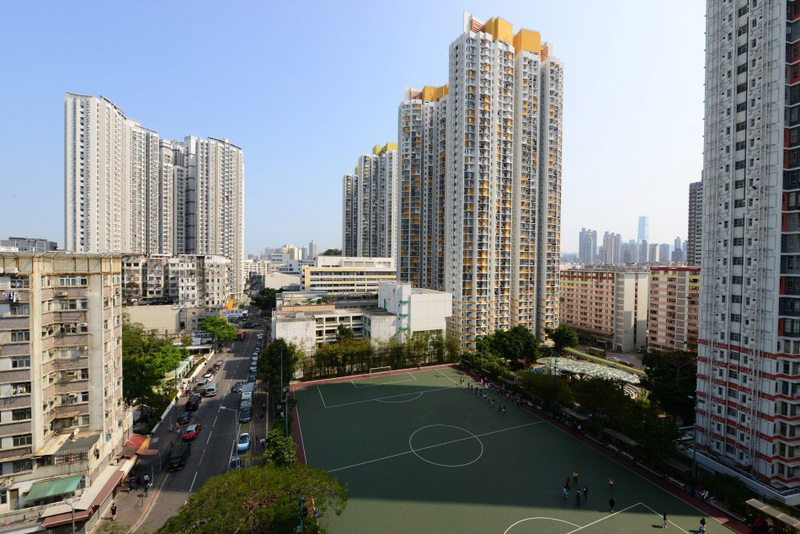 In Hong Kong, redevelopment of an old neighborhood is often a controversial matter, especially when it involves eviction of existing occupants, or replacing an old neighborhood with new residential towers and shopping malls. In recent years there has been public concerns regarding the anticipated relocation of the vendors at Yen Chow Street Hawker Bazaar in Sham Shui Po. Opening its doors since the 1970s at the intersection of Yen Chow Street and Lai Chi Kok Road, the specialized textile bazaar has been a popular destination for fabric seekers from fashion design students to amateur seamstress throughout the city. The bazaar stalls are laid out in a grid pattern, under patches of roof covering consisted of corrugated metal and nylon sheets. A visit to the bazaar is like a treasure hunt that involves meandering through narrow aisles and flipping through piles of colourful fabrics, bags of buttons and rolls of ribbons at each 3m x 3m vendor stall. The bazaar is chaotic, cramped, dark, and can be stuffy in humid summer days. Despite its resemblance to a shanty town , the bazaar does not deter anyone who determines to hunt for prizable fabrics and accessories in affordable prices, and to enjoy a disappearing shopping culture that emphasizes human interactions. It is the type of old school shopping experience in which friendly and long-lasting relationship between returned customers and vendors can be built up over time. The unique atmosphere, unpretentious setting, and sense of community of the Yen Chow Street Hawker Bazaar belong to a disappearing Hong Kong. In a city shaped mostly by retail franchises and real estate developers, and where retail streets and shopping centres are looking more repetitive as ever, small independent businesses and grassroots communities are becoming more vulnerable and helpless in the rapid process of urban development. From outside, Yen Chow Street Hawker Bazaar looks like a shabby village built at a city park. Once inside, the chaotic bazaar is a treasure trove for many. Fabrics and accessories are piled up high along both sides of narrow aisles. Some vendors own multiple stalls. In many occasions, customers would need to call the owner over from another corner of the bazaar. After forty years, a number of the existing trees have become permanent features in the bazaar. Each stall has its unique arrangement and textile selection. Some stalls even offer sewing service. One may wonder how the vendor can keep track of his or her merchandises from the piles of items at the stall. Apart from fabrics, ribbons are also popular. And so as buttons of different colours and styles. Encouraging messages written by customers and supporters for the bazaar vendors are pinned up at a stall. Big banner urging for establishing an official textile market at the current location is hung at the bazaar entrance. A supporting banner made of fabric strips is also hung at the exterior fence along Lai Chi Kok Road. Photos showing the vendor community expressing their unity and determination to fight for their own survival at the current site, in protest to the government’s relocation proposal of the bazaar. Throughout much of the 20th century, Hong Kong has undergone massive economic development and urban transformation, from a small trading port before WWII to one of the most successful industrial capitals in Asia in 1970s. From 1980s on, most of the city’s manufacturing industries have moved to either China or elsewhere in Asia. Today, large numbers of industrial buildings that once housed almost half of Hong Kong’s work force have been given a “second life” and converted into various spaces for light manufacturing, creative industries, storage facilities, or small offices for all kinds of businesses. 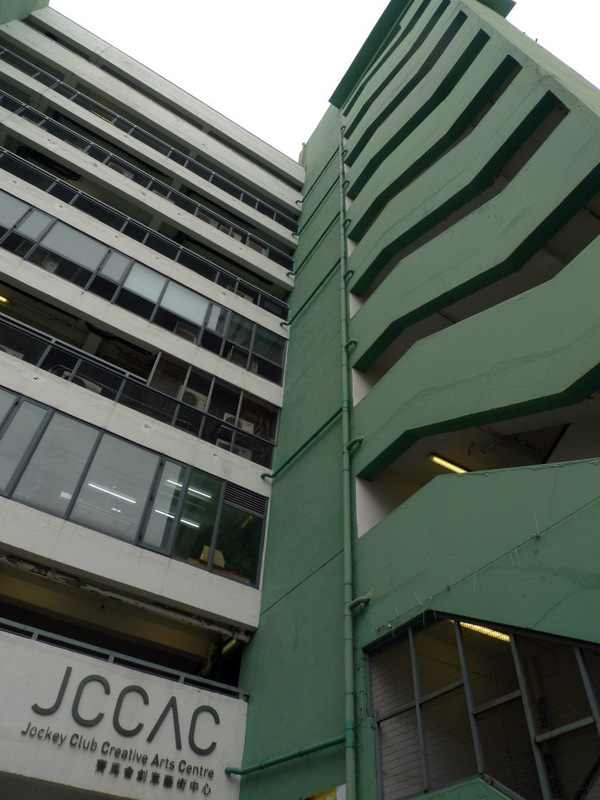 JCCAC in Shek Kip Mei is a recent example of adaptive reuse of former industrial building in Kowloon, Hong Kong. 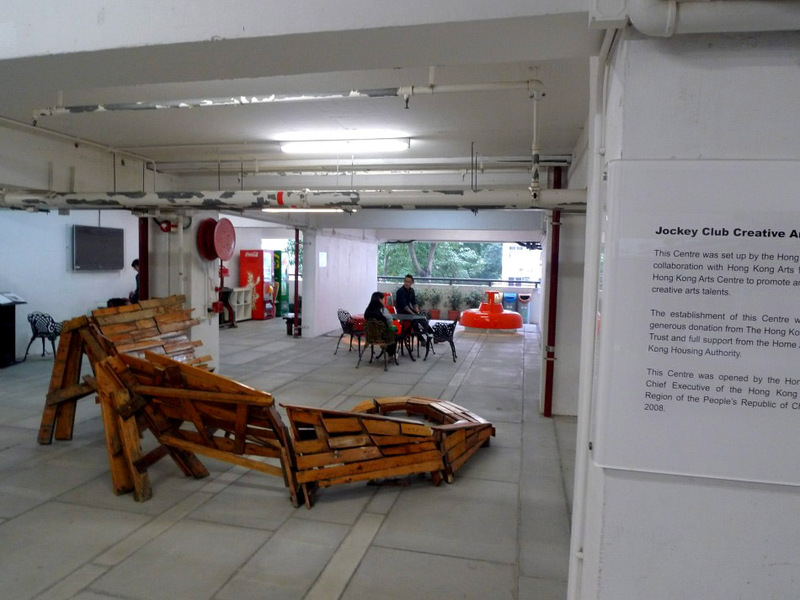 Opened in 2008, Jockey Club Creative Arts Centre (JCCAC) is a “multi-disciplinary arts village and art centre”, providing affordable studios and exhibition facilities for the art and design community. The centre welcomes the public to visit the shops, studios and café within the complex 7 days a week. 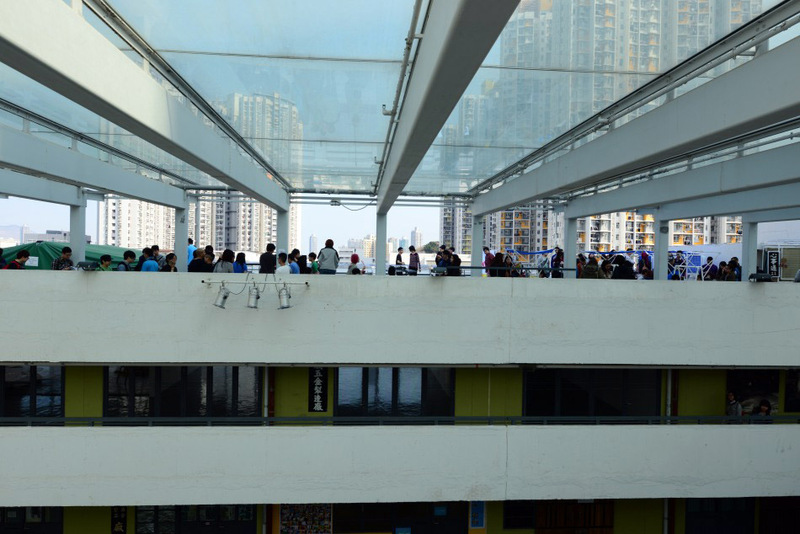 From time to time, JCCAC would host shows and design fairs to further engage the public and the immediate neighborhood. I visited JCCAC during its annual handicraft fair. 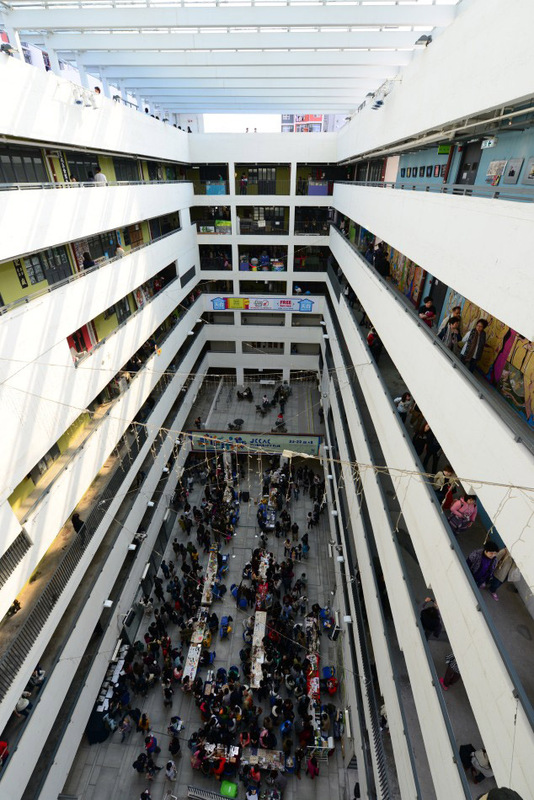 Much of the ground floor atrium was turned into a market fair, while many studios on the upper floors had their handicraft shops open to the public. The open roof was animated by various activities. At one corner, a patio was packed with stalls selling vintage clothing, housewares and books. At the other corner people were lining up for henna art. On the wall adjacent to the main stair was a photo exhibition with the theme on local community. 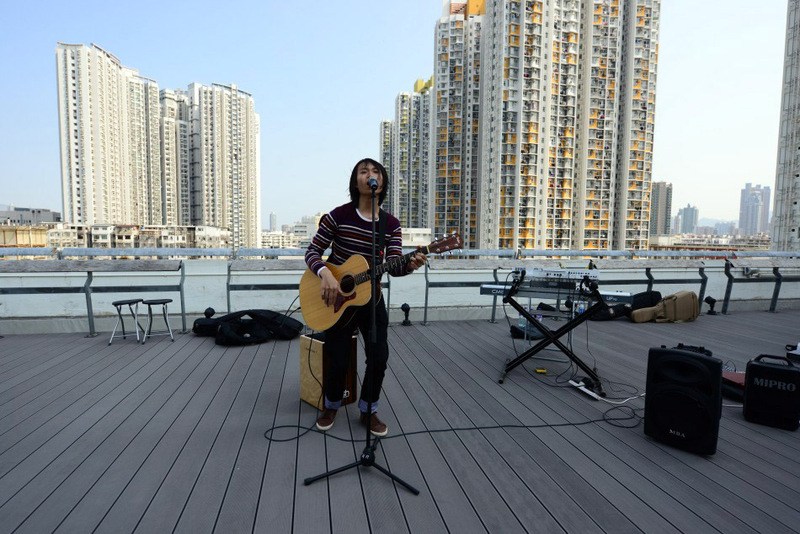 A local band brought in live music to create an upbeat atmosphere. Looking out from the roof parapet, layers upon layers of apartment blocks seemed never ending. 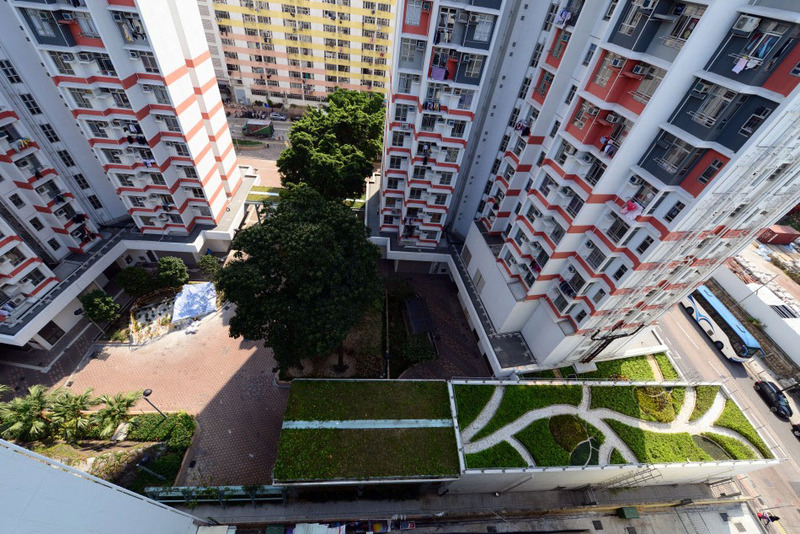 Recent effort by the housing department to upgrade or redevelop the old housing estates in Kowloon was clearly visible from the vivid new paint colours on the apartment facades, planters with local flora, and new green roof design. Angela and I started “Blue Lapis Road” in 2013 to publish a photo journal of our backpacking trip to South America as we wandered through the vast continent in 90 days. It has been over 3 months since we left Valparaiso of Chile, the last destination of our S.A. trip. Since early March, I have relocated to another continent and started a new life chapter in Hong Kong, a city that I was once very familiar with as I spent my childhood here two decades ago. 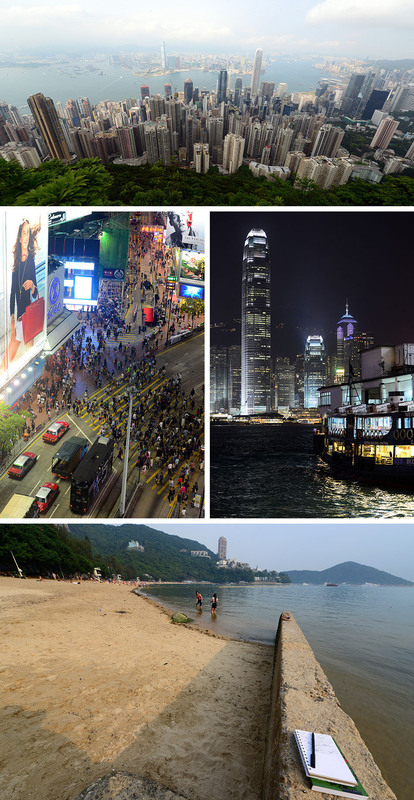 With vibrate city life, complex social structure, recent colonial memories, multifaceted regionalism, intertwining global cultures, hyper dense neighborhoods, vast countryside, and subtropical beaches, Hong Kong has much more to offer than just fine dining, crazy shopping, and extravagant night life. In the next chapter of “Blue Lapis Road”, we are going to share with you our explorations in this magnificent metropolis, Hong Kong.